Armeg PZ1 VDE interchangeable screwdriver blade is part of Armeg's Switch-Blade range, designed to be the ultimate interchangeable VDE screwdriver set. This blade is designed to work with Armeg's VDE torque screwdriver, VDE screwdriver handle and VDE T-Handle to provide the flexibility required to work on a variety of live installation applications - saving you time, space and money. The Switch-Blade simply clicks into the handle, while the quick-release twist mechanism allows them to be removed easily. 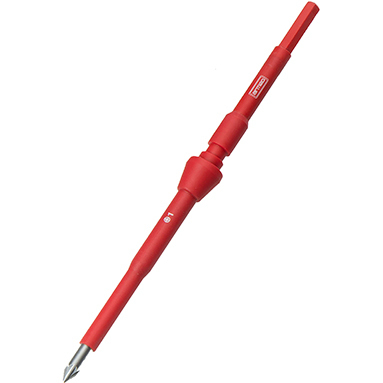 The screwdriver head profiles are manufactured from chrome vanadium, which is precisely machined and heat-treated to provide extended product life. Switch-Blades are 1000V VDE rated for confidence and safety when working on live installations.